Piso Fare 2019 Promos Until 2020: New Promo Fares for 2017 Launched! New Promo Fares for 2017 Launched! The cheapest one-way, all-in fare you can get for a domestic trip from Manila is P1499. With this promo, you can actually now take a flight to Bacolod, Cauayan (Isabela), Cebu, Iloilo, Kalibo, Legazpi, Masbate, Naga, Roxas, San Jose (Mindoro), Tacloban or Tuguegarao. There are no other promos from other base destinations. So if you hail from Manila, you're just so lucky to avail these promos! If you wish to visit other countries this year, there are a lot of cheaper promos you can avail. 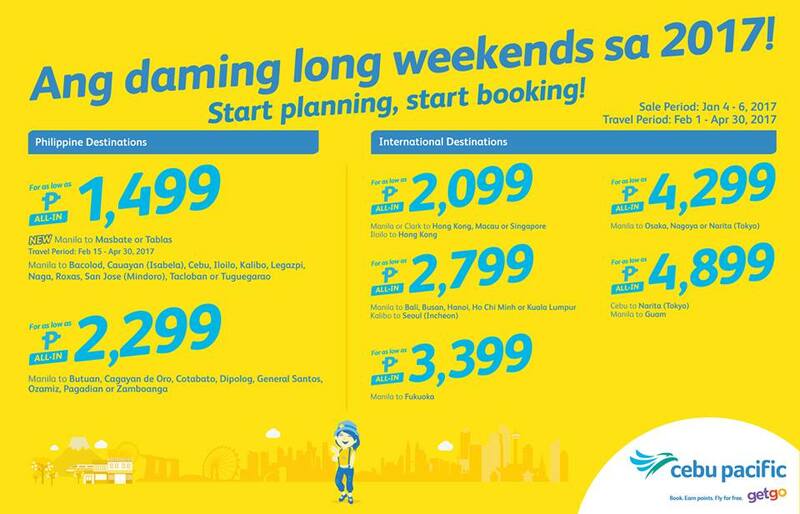 Like for P2099, you can now visit Hong Kong, Macau and Singapore! You may also want to check other Asian cities like Bali, Busan, Hanoi, Ho Chi Minh or Kuala Lumpur. I know, a lot of Koreans are traveling to Boracay. There's a direct trip back to your city, Seoul from Kalibo and that's on promo fare! So take advantage of that! For more Piso Fare promos, keep praying! But we promise, you'll be the first to know!